With our attention to detail and years of experience, ServiceMaster Restore of Northern New Brunswick is the name that homeowners count on for reliable disaster restoration services. Our technicians are the most highly trained in the industry. We are equipped with industry-leading technologies and techniques to provide your home or business with top quality restoration services. 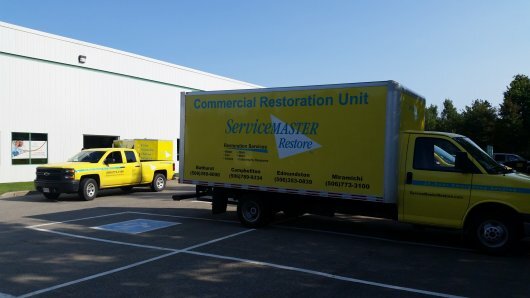 Whether you’re dealing with water in your basement to fire and smoke damage in your kitchen, ServiceMaster Restore can be of service to you. When the unexpected happens, call on the quick response of ServiceMaster Restore at 350-6000 (Bathurst area), 789-9334 (Campbellton area), 353-0839 (Edmundston area)‪‪ or 773-3100 (Miramichi area). Our emergency response team is here to take your call 24 hours a day, 7 days a week, 365 days a year. "I love the work they've done in our home.... They made sure to reassure us all the time... Very hard working crew, caring, honest,etc." "Excellent work. I was 100% satisfied. They went over and above what needed to be done." "The service was fast the estimate was very reasonable, the workmanship was excellent, I would and have recommended Service Master to my friends and family.I recently had water damage in my house and travel trailer and before even having the chance to call Service Master they were right there giving me advice on the clean up and the rental of the proper equipment." "ServiceMaster helped keep peace of mind and calm to a very stressful situation. Not only did they complete work on time, they were friendly, professional and clean. We will most definitely recommend your services to friends and family! " "You have done a great job. I would highly recommend your sevices.I would rate your company a 10."